Its other name, Rock Bells, refers to its being found on woodland ledge tops in the East. This native was brought into gardens by 1640. The elegant red and yellow flowers have long spurs and dangle on the end of wiry stems. Unlike modern hybrids, they are resistant to leaf miners. Self sows. Its other name, Rock Bells, refers to its being found on woodland ledge tops in the East. This native was brought into gardens by 1640. The elegant red and yellow flowers have long spurs and dangle on the end of wiry stems. Unlike modern hybrids, they are resistant to leaf miners. This variety of Helen's Flower has lovely coppery-red daisy blooms that bloom for a long time in late summer and fall, adding just the right contrast to monkshood, veronicastrum and lavender blue asters in moist, well-drained soil. 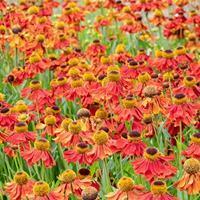 A stalwart of northern gardens it is an easy care choice. Deadhead to prolong bloom, or shear after bloom and divide every 4 years or so. Planted by George Washington and admired by Bartram in his catalog as “a most elegant flowering plant”, Texas Star has startlingly large luminous bright red flowers that bloom midsummer to fall. Excellent in large tubs, they can be overwintered dormant where not hardy. This showy native flower is easy to grow and makes the transition from its native stream habitat to the humus enriched garden bed seamlessly. 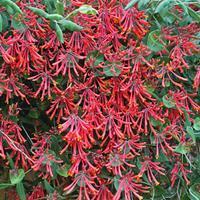 A long-lived perennial with late summer blooming spires of sparkling red flowers, a must for the hummingbird garden! Poisonous. This showy native flower is easy to grow and makes the transition from its native stream habitat to the humus enriched garden bed seamlessly. A short-lived perennial with late summer blooming spires of sparkling red flowers that readily self-sows inhospitable areas. 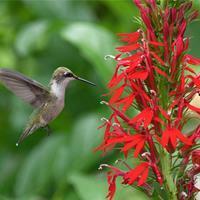 An essential hummingbird garden plant. One of my earliest loves, annual Drummond's phlox holds its large candelabra blooms strongly upright, all the better to appreciate its lovely colors and patterns. Or in this case its lipstick red flower clusters. Long blooming, thriving with little care, it does best in an airy spot in fertile, well-drained soil. Listed in an 1886 and 1897 garden catalog. The more common red salvia was first described in 1778. A handsome bushy plant with head-turning red flowers and smoldering dark calyxes blooming on tall spikes summer to fall. Tolerates humid heat. Plant Select® Winner! 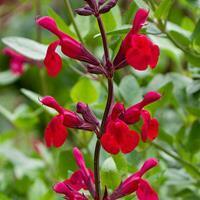 An irresistible new salvia that blooms for months starting in summer. Tall wands of cherry red flowers held in burgundy calyxes invite hummingbirds with the abundant open tube-shaped blooms. A graceful open habit, trim 6” in June for a more compact habit. Remarkable hardiness to zone 5. Regular well drained soils a must. Native to southern areas of the US. Masses of brilliant red and occasionally yellow tubular flowers on tall stems. The foliage is needle-like. Grow in sandy, well-drained, sweet soil. Listed in an 1894 catalog. Self sows. Biennial to short lived perennial, often grown as an annual.